I got my kids to eat butternut squash! And I didn’t even have to hide it under a layer of cheese. Of course, the pasta and pancetta (i.e. bacon) helped. Honestly, the creamy sauce of puréed butternut squash is so good you could almost leave out the pancetta. However, the fried pancetta and sage really do add to the dish so I wouldn’t really skip that part. The amazing thing about this creamy sauce is that there is actually no cream in it. It tastes rich without actually being rich. I used butternut squash for this recipe and thought it was fabulous – creamy with a hint of sweetness. Just be sure to purée the squash thoroughly to get a nice smooth sauce. Bon Appétit says that kabocha squash is even creamier and sweeter than butternut squash. I couldn’t find any kabocha squash at my grocery store but if anyone tries this recipe with it, I would love to know how it turns out. This recipe is a great way to work more vegetables into your family’s diet. It was a big hit in our house. Both of my kids said how good this dish was as they happily slurped up the noodles. You can cut down on the pancetta if you want something lighter or use a whole-grain pasta for added nutrition. Heat oil in a large skillet over medium heat. When oil is shimmering, add pancetta and cook, stirring occasionally, until crisp, 8-10 minutes. Add sage and toss to coat. Using a slotted spoon, transfer pancetta and sage to a small bowl; set aside. Add squash, onion, and garlic to skillet and cook, stirring occasionally, until onion is translucent, 8-10 minutes. Add broth. Bring mixture to a boil, then reduce heat, and simmer until squash is soft and liquid is reduced by half, 15-20 minutes. While the squash is cooking, cook pasta in a large pot of lightly salted boiling water, stirring occasionally, until al dente. Drain pasta, reserving 1 cup pasta cooking liquid. When squash is done cooking, let it cool slightly in pan then transfer squash mixture to a blender. Reserve the skillet. Add 1/4 cup of the pasta water to the blender and purée until very smooth; season with salt and pepper as needed. The purée should be the consistency of a thick pasta sauce. If it is too thick, add 1-2 additional tablespoons of pasta cooking liquid and purée to combine. Combine pasta and squash purée together in the reserved skillet and cook over low heat, tossing and adding more pasta cooking liquid as needed, until sauce coats pasta, about 2 minutes. Mix in ¼ cup grated Pecorino; season with salt and pepper. Serve pasta topped with reserved pancetta and sage, shaved Pecorino, and more pepper to taste. Recipe from Bon Appétit, February 2014. This pasta looks so flavoursome and delicious. I am just loving all that crispy pancetta ontop! 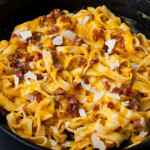 The pancetta was my favorite part too (though the creamy butternut sauce was a very close second). This is a fabulous idea! I definitely need to try this the next time I make pasta. And the pancetta topping…YUM! Thanks, Kathleen. I hope you like it. It really is fabulous! Thanks for the comment, Hanna. Let me know how you like it. This was tonight’s dinner, and it was FABULOUS!!! Wow. This indefinitely going into my recipe book. Thank you for sharing!!! Thanks for letting me know. I am so excited everybody liked it! I tried it with the kabocha!! Creamy and slightly sweet. I absolutely loved this recipe and will DEFINITELY be making it again, thank you so much!!! So glad to know the kabocha works!! And so happy you loved the recipe! !